A huge thanks to Kirkland’s for sponsoring today’s post and to Deb at Seeking Lavender Lane for hosting. This post contains affiliate links. Thank you for purchasing through them to help support this blog! 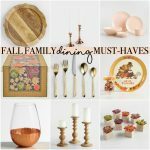 I am super excited about today’s post because we’re giving you a peek at some of our fall decor, and sharing more bloggers who are doing the same! 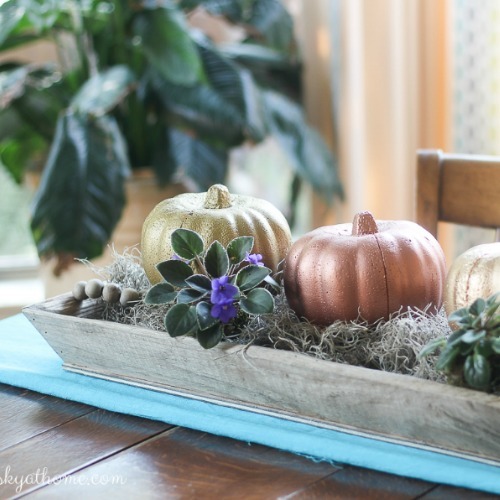 I don’t know about you, but I love seeing how other people decorate for the seasons – it’s so inspirational! 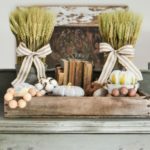 Each year I tend to pick up a piece or two of decor to add to that seasons collection, and gradually we’ve built up our seasonal decor over the years. I kind of like it that way, too – each year adding something new. 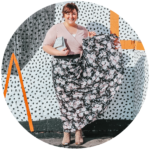 Recently, I shopped Kirkland’s for some fun new Fall items, and I can’t wait to show you what I got! 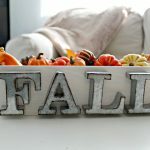 So let’s take a peek at some of my fall decor (so far) ;). I love the coziness of Fall, the season where you can never have too many blankets. I want our home to always be that soft place to land after a hard day. Plus, with Wyatt being on Autism spectrum, he’s very particular when it comes to how things feel, the softer the better for him, and you’ll see those soft touches around our home. 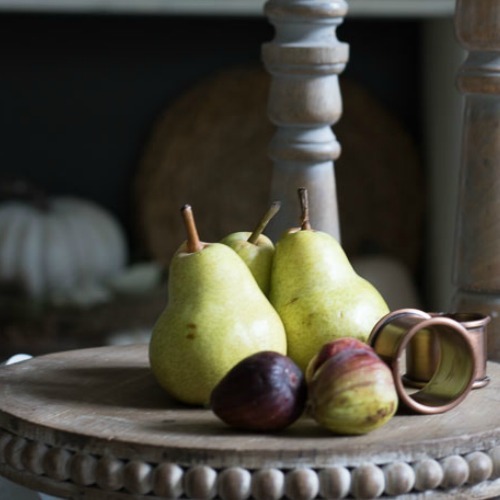 We’re all about cooler tones and cozy textures, and Fall is just the perfect season for both of those things! 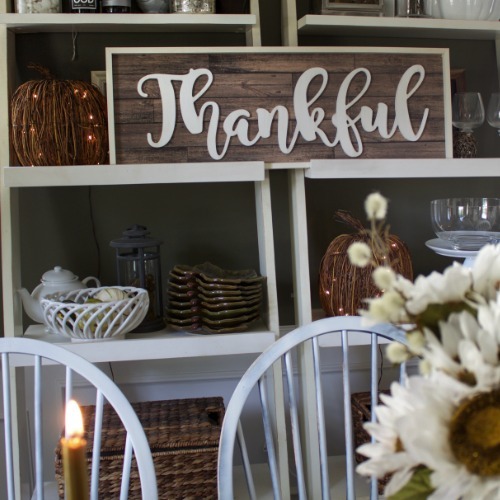 I absolutely love this Thankful Wood Plaque because it’s such a statement piece. I wasn’t too sure what to do with our mantle because I didn’t want to have to take down the wooden sign with our wedding lyrics on it, so layering it was! 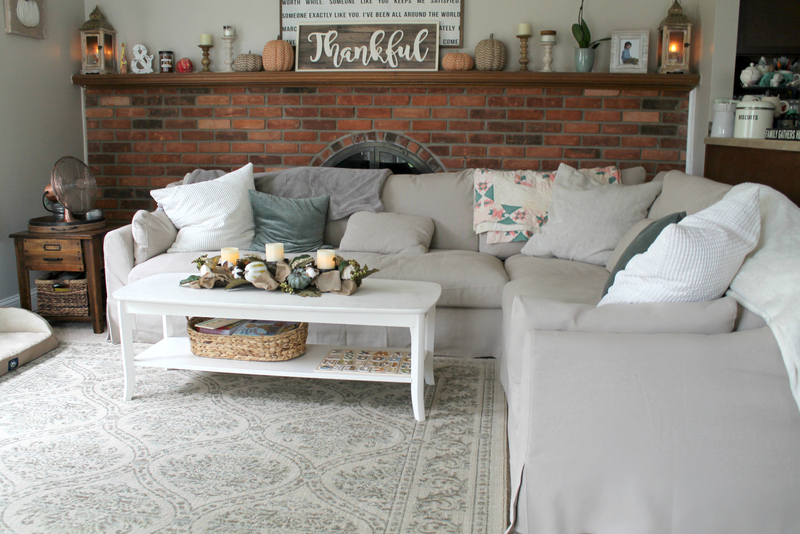 I really love the way it looks up over the sofa, the whole space is ready for relaxing as a family with the windows open and that cool fall breeze coming in don’t you think? We recently upgraded to this sofa, and the extra space with a larger sectional has provided us the perfect spot to cozy up for family movie nights! Our whole family can fit on this sofa together which is something we’ve never had before! Yep, that’s right, two adults, two kids, two dogs, and three cats – we all snuggle up together with plenty of room to spare! 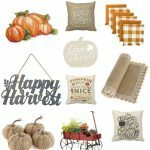 Pictured in living room: Harvest Tan Pumpkin Canvas Art, White Thankful Wood Plank Plaque, Burlap and Pumpkin Centerpiece, Living Room rug here. Everything in our house has to be safe for the kiddos, which is why you’ll see lots of LED candles and items out of reach. 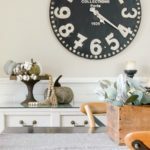 We also love to do crafts and projects together so you’ll see things like ceramic painted animals and painted mason jar pumpkins on our mantle and table. 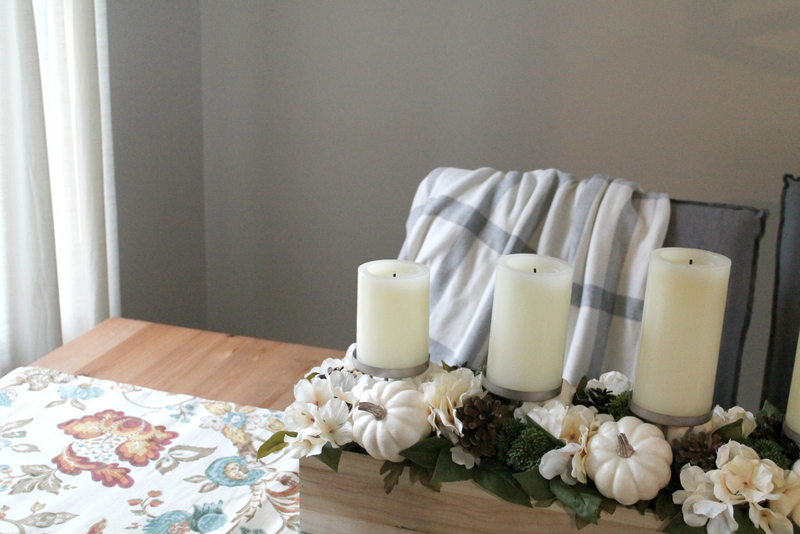 I love incorporating things my kids made into the decor, because that’s what makes our home, ours. Pictured: Definition of Home Wall Plaque. I hope you liked getting a little look into our home today, it was fun to share it with you all! Now, for the extra special part of today’s post – the giveaway! Keep scrolling to see how you can enter to win a $1,500 gift card to Kirklands to spruce up your home for Fall! 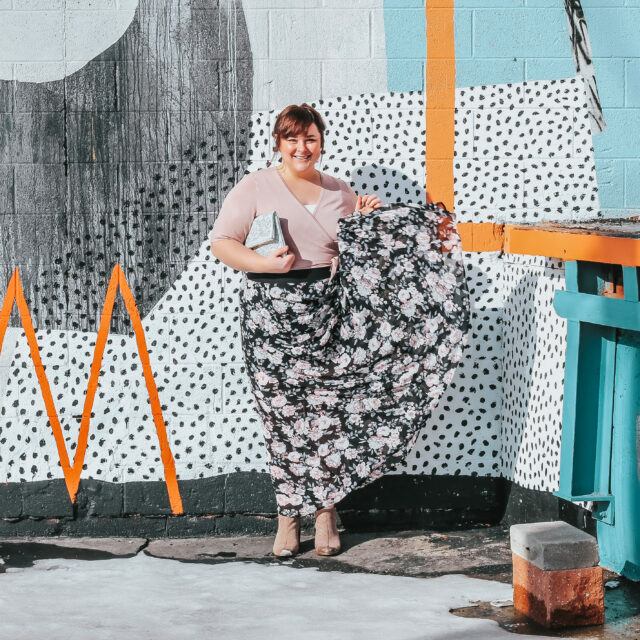 And be sure to check out all of these amazing bloggers who are also sharing their fall decor! Now for the giveaway! Just enter via the rafflecopter below for your chance to win! Good Luck! Love all of your fall touches! 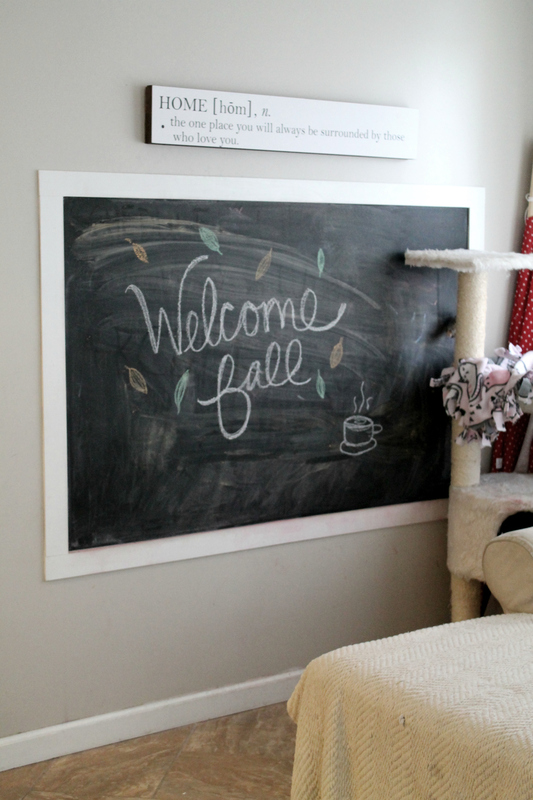 Your home is cozy and welcoming for the best season of all! 🙂 Happy Fall! Beautiful tour! I didn’t know you had an autistic son – you’ve done a great job of creating “soft surroundings” in your home. We have the same wall clock – I love it. I also love your living room rug. Do you mind sharing where you got it? 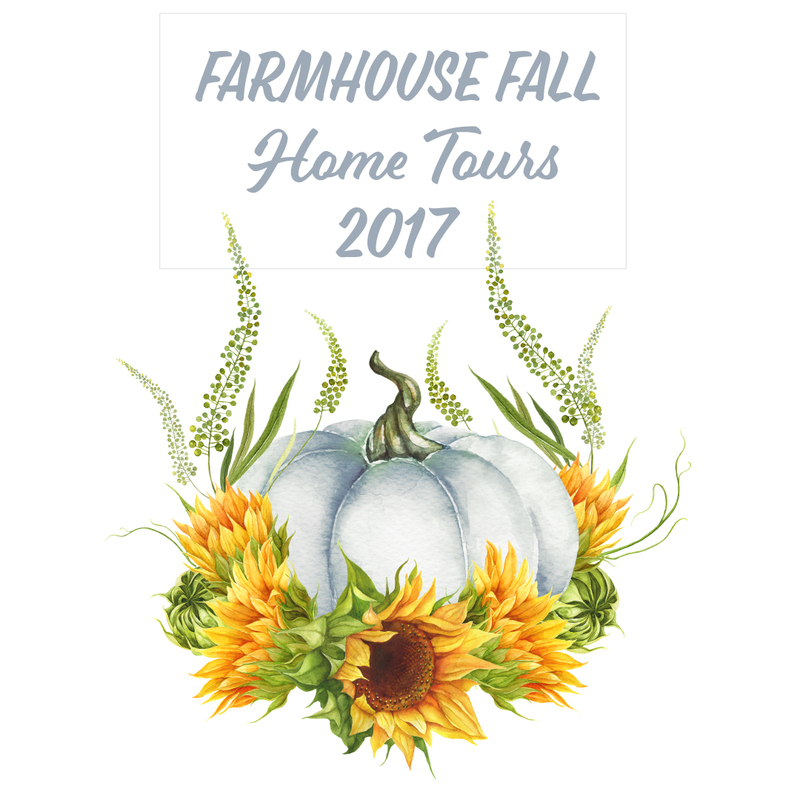 Kendall, I’m so happy to be introduced to you and your blog on the Fall Home Tour. You definitely have a feel for design and incorporating your family’s needs. Your home looks absolutely cozy! I love all the little details. Kendall! You’re home is so beautiful and cozy! 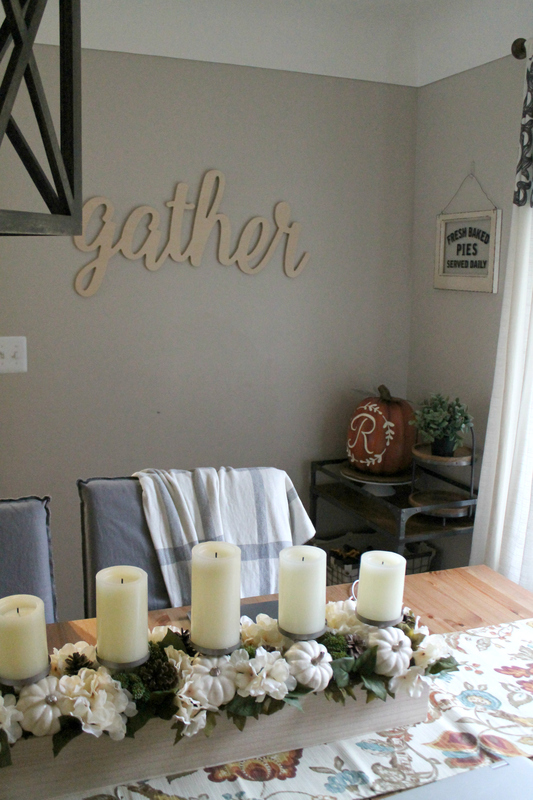 I love the gather sign in your dining room! Kendall your home is so lovely! 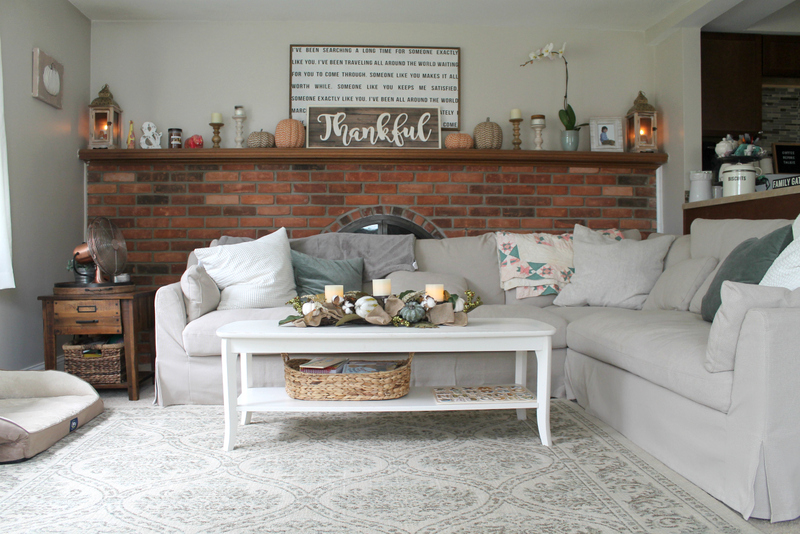 I just adore your cozy living room with all the fall touches. 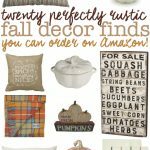 Your home and fall decor are so beautiful! 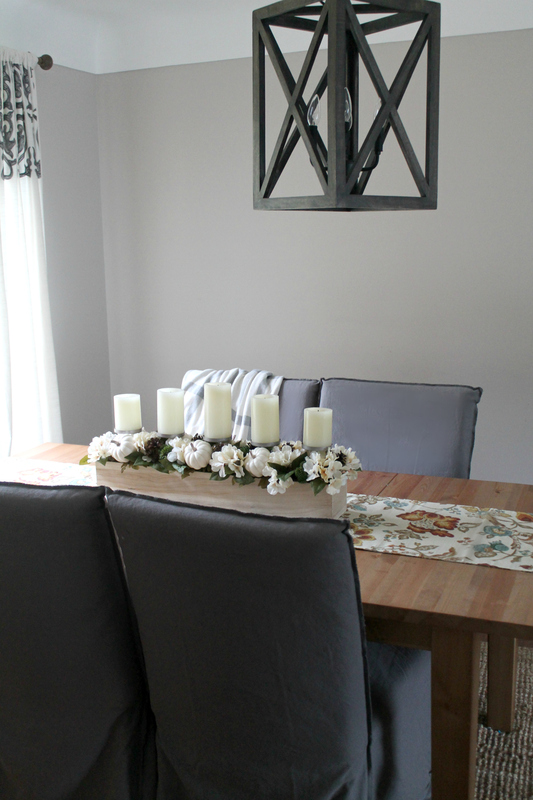 (Your dining room = perfection!) So nice getting to ‘hop’ with you this week! SO cozy! LOVE all those neutral Fall touches! I love that your home centers around your family! Your soft touches are wonderful and I enjoyed the tour! Thanks for sharing! Such a beautiful home…fun touring with you! You have a lovely home, Kendall! Love how you decorated it for Fall. Happy Fall to you! Beautiful tour Kendall! I love your long fireplace ledge!! So unique and beautiful! Happy fall! I love the serene and peaceful feel of your home. The Thankful sign is so beautiful! Kendal, that old brick fireplace is too charming! Everything is so cozy and warm. Beautiful, friend! Your home looks so cozy decorated for fall! Love it all! 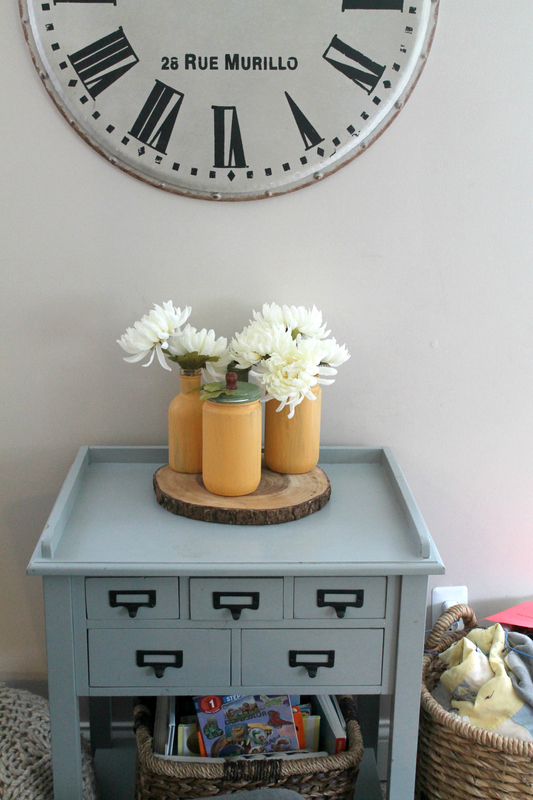 I’m loving the Sliding Door Farmhouse Console Table! I love your dinning centerpiece! lovely home. I would love to get me that thankful sign from Kirklands if ever!! I love the living room rug! But everything is beautiful!